Open market (or English called wet market) was used to be everywhere in Hongkong long time ago. They opened daily selling fresh vegetable, fruit, live chicken and quails, flower, and sometimes wild game. Before the invasion of plastic bag's and mega-store's culture, vendors handed you a bunch of vegetable tightened by a strand of straw. For tomatoes, meat or eggs first wrapped with a small piece of newspaper (most likely cut by their children) before the straw. So I spotted your string beans and you stared at my pathetic tiny beef (... not my pay day you know). Conversation started. Now things are mass-produced, machine-processed. Strawberries and tiny tomatoes are boxed, half pint or one pint. Onions and potatoes are bagged, 3 pounds or 5 pounds. Then proceed to an automatic check out. From the start till the end shopping doesn't involve one single human being... I avoid machine-molded pie-crust and pre-cut vegetable in bag. No time is not an excuse, I won't starve if I can't make it today. On a day that I'm relaxed and have mood to bake, select the best and in season vegetable, buy daily-made fresh cheese from a local store, take an extra minute to make that fancy rim on my pie... even better, walk down to a liquor store with my husband to choose a bottle of wine for the meal. Roll out the pie dough, spread the cheese sauce, arrange the vegetable, sprinkle some olive oil and sea salt, baked in a hot oven (about 400F) until the pie turns golden, takes about half an hour. Once a week I go to open air market:it's nice to buy fruits and fresh vegetables. You can choose and have suggestions and recipes from the sellers. Nice Pie!!! That's looks so delicious. 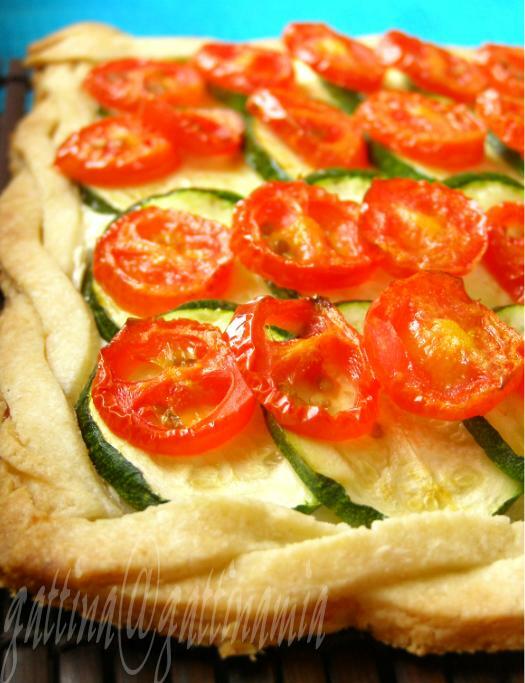 I love to make tarts with fresh tomatoes. It makes all the difference. Your pictrue is so lovely!! that was a homage to slow food. lovely recipe. i too love the smells and sounds of a open market. Saffron, that sound even better if able to talk about recipes and such with sellers! Sher, I didn't like tomato at all... but after WHB and seeing your post (ripe tomato & mayo sandwich), I'm converted! Paz, yoohoo!!! We got a very refreshing and cool morning this week! Again a stunning picture, it looks absolutely delicious. 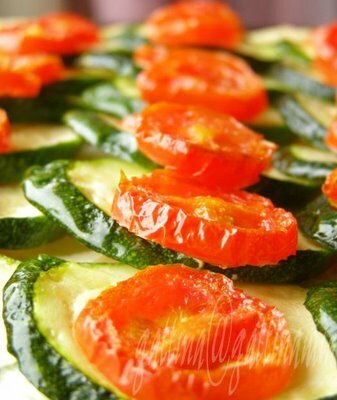 Zucchini is my favourite vegetable, so I really want to give this a try! Tnx! There is nothing more that I love than our weekend trips to the farmer's market.. if I never had to buy groceries in our super-market again, I'd be okay with that! This pie is incredibly gorgeous, Gattina! I would love to make this for a Sunday brunch with Hubbs! Thank you for sharing! Yum yum, How much I know I would love this tart. I am just about to post on one too. 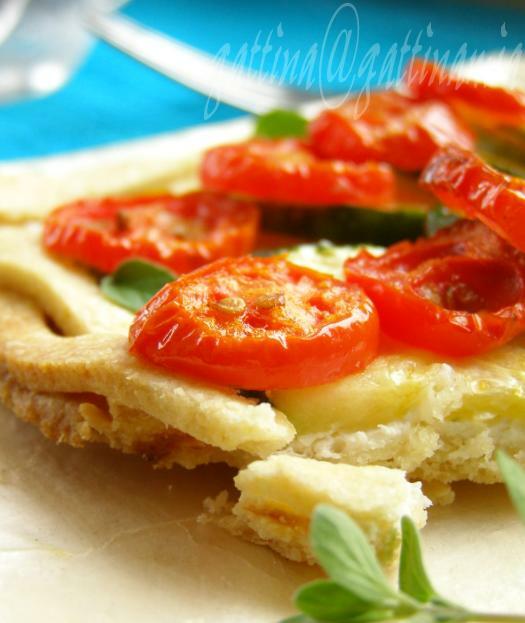 Never trying semolina pie crust, curious about this now! lis, thanks for your kind words. I used to dislike tomatoes... but now love it! Esp on pie with a bit of cheese and herb... can't resist! Julia, I love zucchini very much too! Is its season almost over? But please let know if you will make something with it, I definitely will try too! Bea, oh really?! How could I miss any of your gorgeous pie? Will go check yours out!